Back to sea, here's a shot that definitely belongs to my favorite shots from Greece! 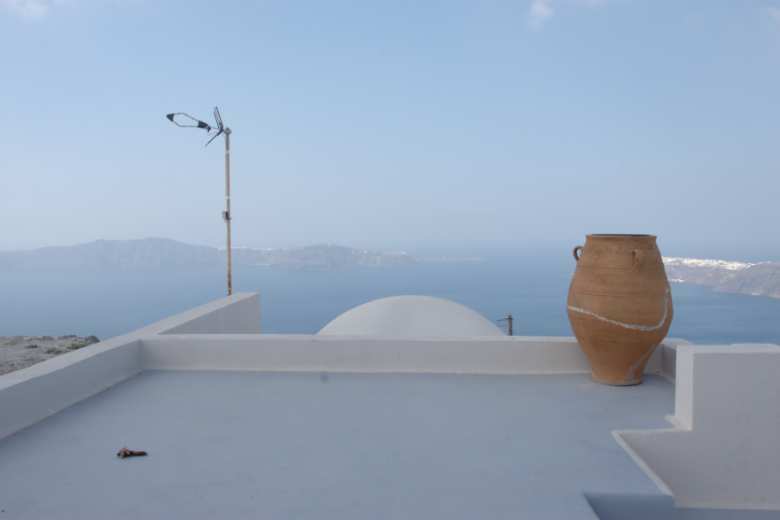 It is taken in Fira, the main city on Santorini. On the far right in the background there's the city of Oia (pictures coming soon!) and on the left one sees the island Therasia. While I usually would have cursed the cloud that was diffusing the sunlight, I'm really happy with it in this pictures: It gave me nice soft shadows that perfectly fit this scene! For post-processing I applied some perspective transformations together with a radial exposure correction, resulting in vignetted corners but a brighter center. I also removed some unwanted "details" for giving this picture an almost surreal and abstract touch.